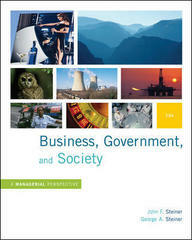 Business, Government and Society: A Managerial Perspective 12 Edition Business, Government, and Society, by Steiner and Steiner, tells the story of how forces in business, government and society shape our world. While current events move rapidly over the surface of the subject matter, the underlying principles and relationships at its core lie undisturbed.The Twelfth edition of this popular textbook is equipped with new chapter opening stories and cases that reflect current concerns in a changing environment. The thorough blend of history and today’s events help students understand the entire context of forces at work in business, government, and society. A new emphasis on management issues and processes allows students to apply the principles they learn to real world situations.